Crumb by Crumb: I am obsessed with the Carpenters. Oh yeah, and I saw Spider-Man 3 last night, too. WHO'S HOTTER: Chris Evans or Daniel Craig? WHO'S HOTTER: Marlon Brando or James Dean? Sometimes I hate being a Mac user. ...because I like to sing along. 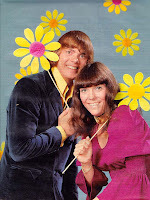 I am obsessed with the Carpenters. 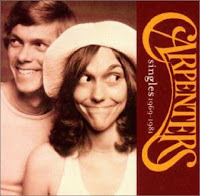 Ever since I saw Superstar: The Karen Carpenter Story, I've been obsessing on the Carpenters. Lately, though, the obsession has moved away from Todd Haynes' film and toward the actual people and actual footage of them, Karen Carpenter especially. I recently watched the old E! True Hollywood Story on Karen Carpenter (on YouTube, in 8 parts), and now I know a lot more about them. Unfortunately, Haynes got a lot wrong in his film, in terms of the Carpenters' actual personalities and personal histories. The facts and events he emphasized didn't seem to accurately reflect the Carpenters' lives, and neither Richard nor Karen really comes off the way Haynes portrays them. This doesn't necessarily detract from the film, per se (I still think it's brilliant), but I can understand a little better now why Richard filed that "cease and desist" order. 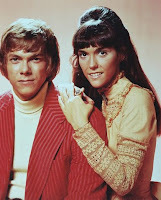 Superstar is not, and should not be seen as, a factual depiction of Karen Carpenter's life. She was not the ditsy barbie doll the film made her out to be (though many anorectics are). She was a mysterious, fascinating, troubled, lost young woman, tomboyish as a child and an icon of femininity as an adult. I highly recommend her E! True Hollywood Story to everyone. It, too, is not an objective portrayal by any means, but it at least features actual footage of Karen, her family, and her friends, and features a variety of perspectives on her life and work (there's a BBC doc on YouTube, too). But even more highly do I recommend the Carpenters' music itself. Growing up, I knew them vaguely as a cheesy brother & sister act from the 70s, but had never actually sat and listened to their songs. Now that I have, I'm thoroughly smitten. These songs are GOLDEN. Richard's music and Karen's voice will live on forever in legend, as will Karen's legacy as a martyr to stardom in general, and anorexia nervosa in particular. Here, for your enjoyment, are the original music videos of five of their best songs. First, the haunting gorgeousity of "Superstar." Next, the bittersweet ballad, "We've Only Just Begun." Then, the melancholy "Rainy Days and Mondays" and Karen's performance of "Ave Maria." And finally, the song that made them superstars, "Close to You." Rest in peace, Karen. You deserve it. Hey great post! I'm a straight guy and I love the Carpenters! The reason I mention that is because in some people's view liking/loving the group and their music is a gay cliche (the soft, "feminine" sound?) I know that they have a big gay fan base -- especially Karen who is a gay icon and whose pain and voice is identifiable to gay men in particular. Like other female singers. Do you have this sense of Identication?